First gear jumping out when moving off, especially on hill starts, is a common problem on all ‘Sevens’. The remedy is quite simple but involves removing the gearbox and so the job is best left until a major task, like clutch renewal, is required. The problem is usually caused by a broken spring, that holds the 1st/2nd selector fork in position on the speed fork rod. It is possible to check this with the gearbox in the car if you can access the top of the box. This is possible with ‘Box Saloons’ and the Ruby and Big Sevens if the floor panel is removed. Remove the gearbox cover and interlock plate. Viewing from the rear of the gearbox the 1st/2nd gear selector fork and rod are on the right; try sliding the brass forks back and forth by hand. There should be NO MOVEMENT. If there is movement then the detent ball and spring are “not doing their job” and should be replaced. This repair applies to all 4-speed gearboxes. Once the gearbox is out remove the top cover and the change speed gate with interlock arm and pivot, exposing the selector forks and rods. Above the prop-shaft flange there are three nuts and washers at the ends of the three rods. NB on later gearboxes there is a locking plate linking the 1st/2nd and 3rd/4th shafts. Remove these nuts and washers and locking plate, if fitted, carefully noting its position. so that 1st/2nd speed shaft rod can be withdrawn. On the earlier gearbox without the locking plate it should be unscrewed from the bell-housing end. On later gearbox with the locking plate it should be gently drifted forward taking care not to damage the threads. If the rod is tight and not easily moved try some WD40; if it is still tight apply a little local heat using a hot air gun. On the later gearbox with the locking plate take GREAT CARE as there is a set of shims on the selector rod INSIDE the gearbox at the back which must be caught as the rod is withdrawn from the housing. Initially only move the shaft forward about 1/2” by which time you should be able to see that the shims are arranged for their capture! Slowly remove the rod and expose the hole where the ball and spring below it are situated. With luck these can be drawn out with a magnet; however if the spring is broken and firmly stuck then it is probably necessary to remove the speed fork completely and tap it out. 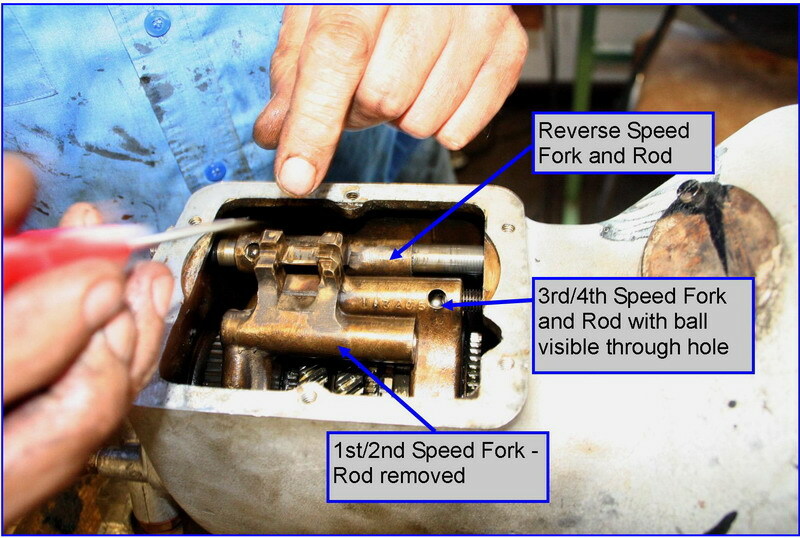 This requires the removal of the other two selector forks and rods from the gearbox. This may be worthwhile as there is now an opportunity to check that all the balls are functioning properly. When replacing the spring and ball it is essential to make sure that the correct size spring and ball are used; some on the market are too small or the spring is weaker. Once the new spring is in place it will force the ball a little proud of the fork arm surface. Apply a little oil to the selector fork rod before sliding it back into the selector fork holding the ball into its hole with a thin screwdriver whilst the rod is moved over it. Replace the shims at the appropriate moment as the rod enters the end housing. As the ball comes to the correct position in the grove of the speed fork rod you will hear a firm clunk; if you don’t then something is wrong, probably the wrong size spring and/or ball. Replace the locking plate, if fitted, washers and nuts and tighten; replace the change speed gate with interlock arm and pivot adjusting the position of the forks, if necessary, by screwing the rods in or out as necessary so that the interlock plate can move freely across the gate without fouling the forks. Replace the top cover and check movement of the gears. Replace the gearbox in the car and, if necessary, replenish the oil. This article, written by Doug Castle and Andrew Jarmin, originally appeared in CA7C Seven Focus in Oct 2009 pp21-23.